One of the more unusual Acacias, and an interesting species, Acacia willdenowiana is commonly known as Wattle Grass. Although it does look a little like grass, the plant itself does form a woody base over time and is certainly not a species suitable for foot traffic. It gets the common name from the modified leaves that do appear grass like. 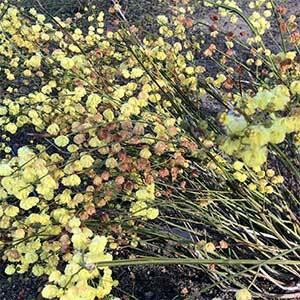 With a natural low growing habit, this little plant will flower with typical yellow wattle like balls in winter to spring. This is a species that is best grown in an open position in full sun, and in a well drained soil. It makes an interesting addition to a native garden planting, or as a feature in the general garden border. When planting consider mounding up, the soil to improve drainage in wet soils. Flowers – Small yellow balls. This is an Acacia species that is rarely offered for sale. It can be propagated from seed, also difficult to find.